(Newser) – Astronomers observing the Perseus constellation have caught a glimpse of the fate that awaits our own planet: digestion inside a giant star. Unusual amounts of lithium were detected inside the elderly red giant BD+48 740, and a surviving planet has shifted to a strange elliptical orbit, leading researchers to conclude that the star recently devoured a Jupiter-sized planet in its solar system, the BBC reports. 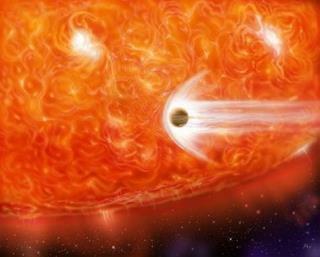 Rising temperatures cause red giants, which our sun will someday become, to expand and devour nearby planets. needless to say to date there is still no wind on the moon nor gravety to pull the dust back to it's surface :) now there's a pipe to smoke on! What kind of wine pairs well with a planet?